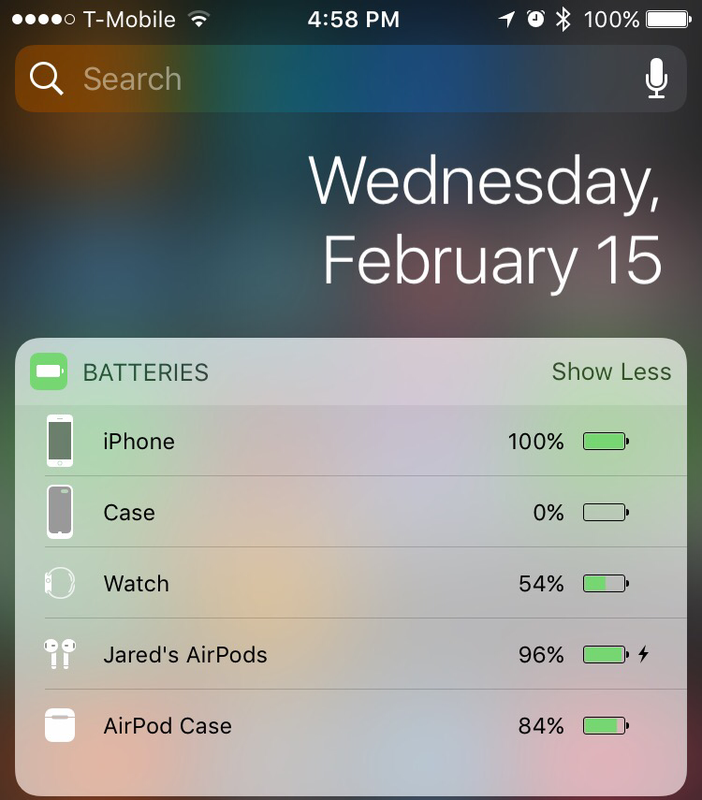 Today I’ll be frequently updating this post in testing the true “All Day Battery Life” of Apple’s, iPhone 7 (on T-Mobile), Apple Smart Battery Case, Apple Watch, and Apple AirPods to see if how they last in real life scenerios . I will not be charging at all throughout the day unless need be. Based on Apple’s stats this combo of products should easily as me all day. Keep checking back for updates! iPhone 7 – Standby up to 10 days, LTE Usage 12 hours, Wifi Usage 14 Hours, Audio Playback 40 Hours. Apple AirPods – Single AirPod charge is 5 Hours, AirPod Case up to 24 Hour charge. 7:02am today. Each of the devices is fully charged. I just got done committing and settling in at work. Listened to all online & high quality streams off Spotify on the commute in. I like how the Apple Smart Case always dumps it’s power into the phone as soon as it needs a single percent. This way if I ever need to ditch the case I’m at 100%. 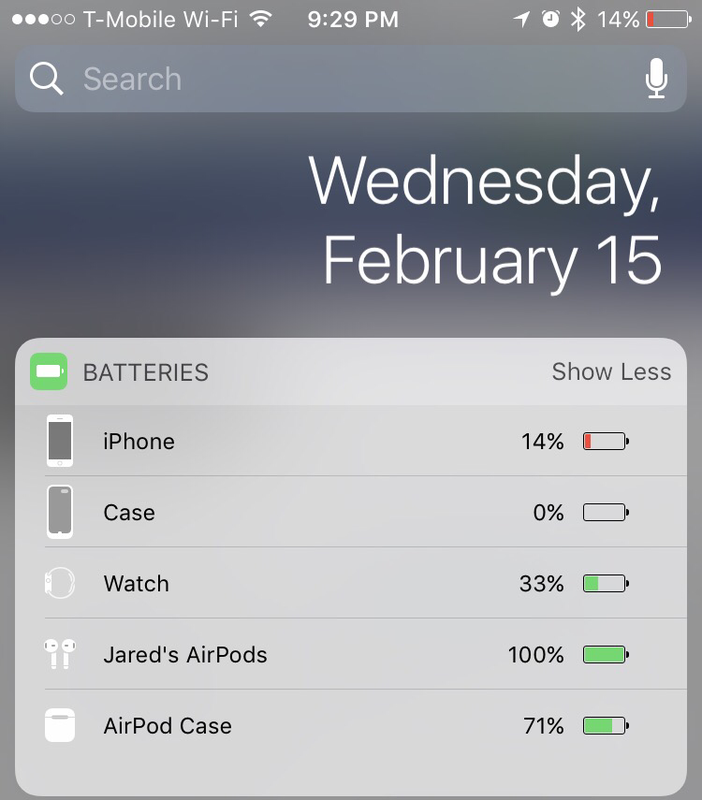 AirPods battery is ridiculous. This is about an hour of use. As for Apple Watch I haven’t done a whole lot of activity with it other than switch the song a few times. I was in meetings most of the last few hours so not a whole lot has changed but I’m headed out to lunch now where LTE usage should be up so we’ll see how it goes. After a bunch of use during lunch and streaming music I’m still really impressed with the AirPods battery life. Not so much with the battery case. For a case that advertises 22 hours of LTE browsing I would venture to guess this is less than half that. I’m a pretty heavy user but I’ve been on wifi most of the day and it’s been sitting idle a lot. When I start working job #2 around 6pm it’ll be dead for sure and I’ll be relying on just the internal phone battery. Well here we are at the end of the day and some of the products really lived up and others truly tanked. Apple Watch performed just as I thought it would with about 30% or so remaining. Not bad considering that I didn’t use the workout app and the Heart Rate monitor would use much more batter life. AirPods are amazing. As you can read in my tech review they blew my expectations out of the water. I’d say I used them for about 5 hours today and they’ve still got 71% of the case charge available and the pods themselves running at 100%. Now for the not so good. Apple Smart Battery Case and iPhone 7 itself. Now I would consider myself a pretty heavy user. But to have both the iPhone and the Smart Battery Case depleate before 10pm is hard for me. If I were going out for beers I’d be walking home since I wouldn’t be able to request a Lyft. I’ve mentioned Apple’s promises a few times throughout this ongoing blog but I really think it’s far off from what they’re estimating. Check back soon as I’ll be performing many other real world tests like “Can an iPad Pro Replace My Laptop” as well as reviews on the new MacBook Pro with Touch Bar. Thanks. Let me know any othe real world tests you’d like to see.